The Rock Factory is your one stop shopping for southwestern gift items. Unbeatable lower prices because its straight from the factory to you. 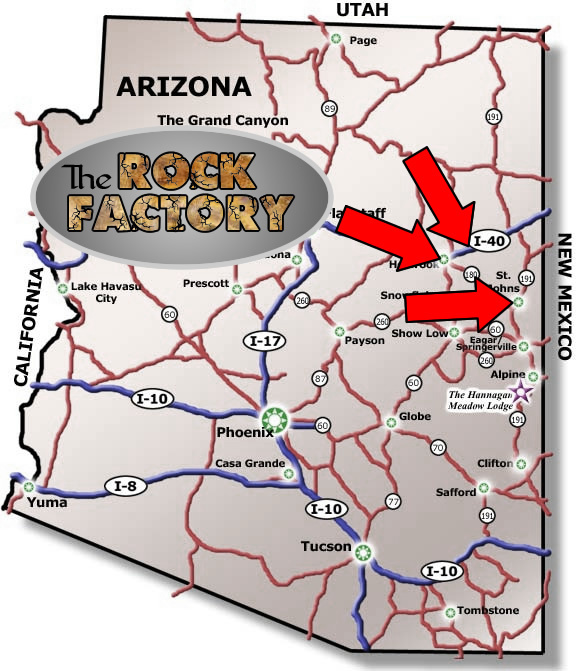 The Rock Factory is a sister company of C & E Rock Sales. C & E Rock Sales has been in business for over 30 years and is the wholesale hub of many retail companies in the area. C & E Rock Sales specializes in cutting and polishing of Petrified Wood and are also producers of quality Arizona Desert Sandstone products. All product are MADE IN THE USA, unless specified. Low prices, without the loss of quality. Large inventory of unique southwestern items that are practical. A cut above the rest in customer service and satisfaction. Two locations to service you.